Want to create an "architecture diagram" to explain our Software (libraries, Eclipse RCP, modules, features, etc.). What is the correct name for such diagrams? You have great ideas, but how do you bring them to reality? Gliffy helps you organize your thoughts. Create professional diagrams quickly with our intuitive interface - there's virtually no learning curve when using Gliffy. No need to buy expensive, OS-specific desktop software. Collaborate with anyone that has access to a web browser. 1-click create cuts down 5 actions in traditional diagram software to 1 click action. That is 5 times faster drawing! Add the next shape and the line connecting it, with a single click and drag. 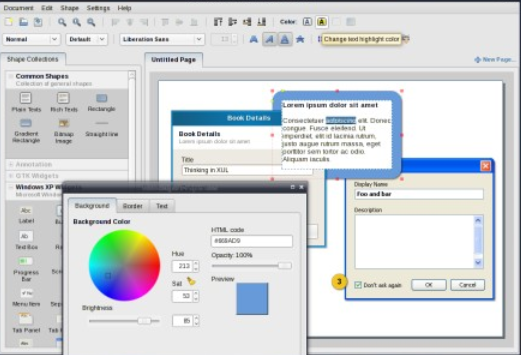 Freemind FreeMind is a premier free mind-mapping software written in Java. The recent development has hopefully turned it into high productivity tool. We are proud that the operation and navigation of FreeMind is faster than that of MindManager because of one-click "fold / unfold" and "follow link" operations. So you want to write a completely new metaphysics? Why don't you use FreeMind? You have a tool at hand that remarkably resembles the tray slips of Robert Pirsig, described in his sequel to Zen and the Art of Motorcycle Maintenance called Lila. Do you want to refactor your essays in a similar way you would refactor software? Or do you want to keep personal knowledge base, which is easy to manage? Why don't you try FreeMind? Do you want to prioritize, know where you are, where you've been and where you are heading, as Stephen Covey would advise you? Have you tried FreeMind to keep track of all the things that are needed for that? it is extensible, and the external tools (I name them plug-outs because they are executed outside BOUML) may be developed in C++ or Java, using BOUML for their definition as any other program. Comprehensive UML analysis and design tool. Rich modeling for business, software and systems. Full traceability from requirements to deployment. 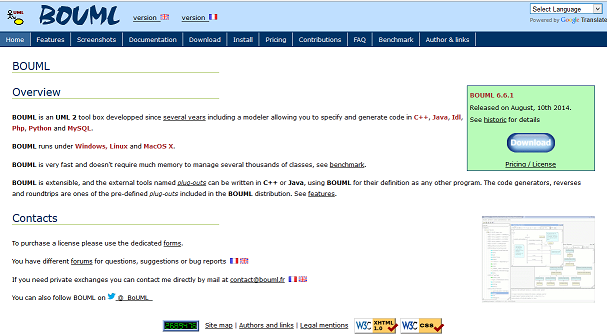 Code engineering in over 10 languages. The Pencil add-on for Firefox is pretty good for simple diagrams and GUI sketches. And if you don't like it as a FF add-on, you can download a standalone version for Linux or windows. Visual Paradigm In modern software development, requirements capturing is not something you can finish at the outset of a project. Instead, new requirements constantly emerge while previously suggested requirements can change throughout the project. To meet the ever changing expectations, we need a way that can facilitate the continuous capturing and management of users' requirements. User stories is one of the approaches that has been widely adopted by many agile projects. Written by users (or customer team), user stories describe functionality that are needed by and valuable to users. As an integral part of many agile development processes, user stories offers a quick way in recording users’ requirements without the need to write any detailed requirement documents, or to have any prior consideration of system behaviors. Websequence For sequence diagrams, only, try websequencediagrams.com. It's a freemium (free for the basic tasks, paid for advanced features) product, and lets you quickly bang out a diagram without any fussing around with lines and stencils. If you're looking to get out the door and working on UML without having to learn a complex new tool I would check out Violet UML. I've used it to some pretty great success in the past. PlantUML is an open-source markup-language-to-UML-diagram tool in Java that deserves to be mentioned here. It ranks high on the usability scale because of its intuitive syntax for the various diagrams and diagram components. Astah UML (ex-JUDE) is pretty good. Finally this list of UML tools on Wikipedia might also come in handy. 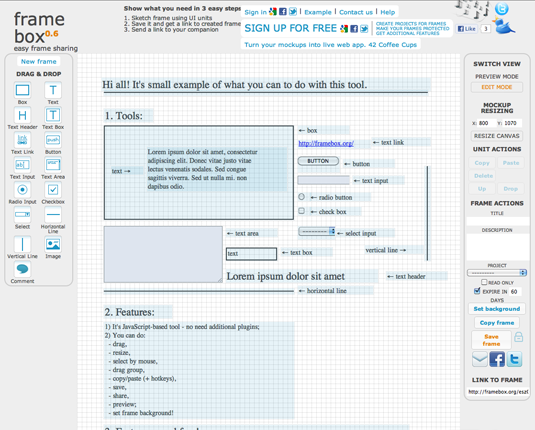 Framebox is a great, free online tool for very simple wireframing. It includes a few drag and drop elements and allows you to share the web page as a unique URL. You can also give your elements titles and descriptions to help explain their function. FusionCharts Free is a Flash charting component that can be used to render data-driven & animated charts for web applications and presentations. It is a cross-browser and cross-platform solution that can be used with ASP.NET, ASP, PHP, JSP, ColdFusion, Ruby on Rails, simple HTML pages or PowerPoint Presentations to deliver interactive and powerful flash charts. Gliffy.com is a free web-based diagram editor. It enables you to create and share flowcharts, network diagrams, floorplans, user interface designs and other drawings online. Registration is required. With Gliffy online diagram software, you can easily create professional-looking flowcharts, diagrams, floor plans, technical drawings, and more. Our online diagram editor makes it easier than ever to create great looking drawings. 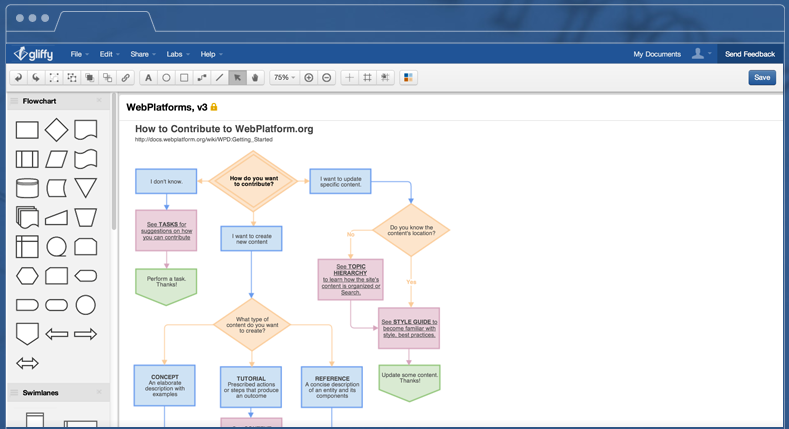 Gliffy allows you to collaborate with other users by sharing your flowchart in a public workspace. Brainstorming sessions, marketing demos or just a clear plan on how to implement a hardware or software rollout in a large company become quick and easy — there’s no desktop client to install or site registration to think about. 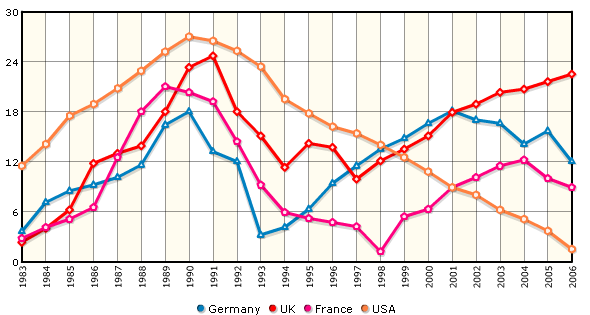 amCharts offers a flexible and easily customizable solution for generating charts “on the fly”. There are 4 sets with predefined Pie & Donut, Line & Area, Column & Bar and Scatter & Bubble. Generated Flash-files are dynamic and can be presented in 2D or 3D. Some flash-charts also have animation effects. amCharts is linkware which means that you have to place a link to the source if you’d like to use it for free. You can also purchase a single site license for 85 Euros (~$117). We’ve already reviewed amCharts. 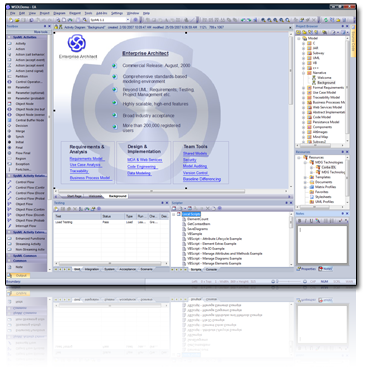 The beginning of amCharts and amMap was in 2004, when the first version of amMap was made. AmMap is a tool for creating interactive Flash maps. You can use this tool to show locations of your offices, routes of your journeys, create your distributor map, etc. Photos or illustrations can be used as layers and backgrounds of maps, so you can make different presentations, e-learning tools and more. export the map as an image. AnyChart is a flexible Adobe Flash based solution that allows you to create interactive and great looking flash charts and dashboards. It is a cross-browser and cross-platform charting solution intended for everybody who deals with creation of dashboard, reporting, analytics, statistical, financial or any other data visualization solutions. 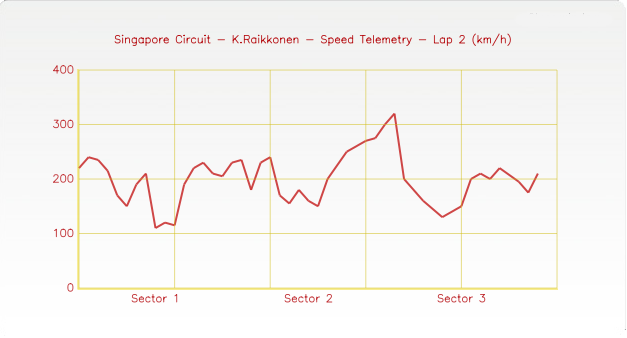 Attractive data visualization is an essential part of any service or application. Ubiquity and performance of Flash technology makes it, probably, the best solution for charting needs. Rich Chart Server generates captivating dynamic Flash charts from ASP.NET and Windows Forms applications. Use the included authoring tool to visually design a rich chart template which can include stunning animation effects, audio narration, text and image elements, links and tooltips, and any other type of visual customization. Apply the chart template to any available .NET data source or XML document to generate an interactive Flash chart with drill-downs, enabling sophisticated data navigation between multiple charts. The other way is that you can assign variables and stream all your data into the Flash Charts Pro, so that if data constantly changing all reflections you’ll see on your chart. Swiff Chart Generator is the server-side solution to dynamically serve eye-catching animated charts from ASP.NET forms, PHP scripts or JSP scripts. Query data from a database, apply your own style template created with the Swiff Chart authoring tool and instantly generates high-impact charts in Adobe Flash format, PNG/JPG format, SVG format and PDF format. pChart is a PHP class oriented framework designed to create aliased charts. Most of todays chart libraries have a cost, our project is intended to be free. Data can be retrieved from SQL queries, CSV files, or manually provided. This project is still under development and new features or fix are made every week. This award-winning component offers the most comprehensive features in the industry, the most complete sample framework, and the best live technical support available. From start to finish, our dedicated team will provide you with the technology you need to make your project successful. 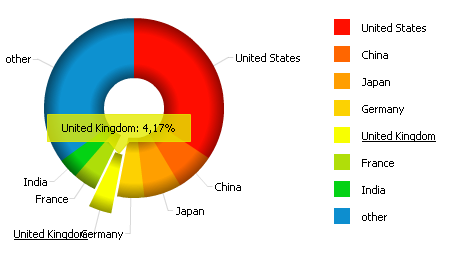 PHP/SWF Charts offers a simple and dynamic solution for interactive Flash-based charts. Columns, circles, bars and pies can be displayed in 3D. You create an XML source to describe a chart, then pass it to this tool’s flash file to generate the chart. The XML source can be prepared manually, or generated dynamically using any scripting language (PHP, ASP, CFML, Perl, etc.). The Commercial License cost 149$ allow you get everything inside the JS Charts free pack plus full support for 1 year.